Most real estate agents will tell you that kitchens and bathrooms sell homes, and if you are wanting to sell your home or if you just want an upgrade that will boost your resale value for the long run, then the place to start is your kitchen. 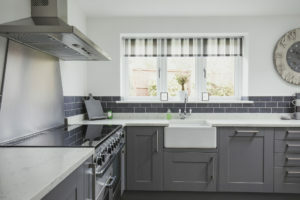 The kitchen is the heart of the home and a common meeting place for family and friends. If you are redoing your kitchen, you will want it to have features you are proud of, especially refinished cabinets. Here are some ideas you can throw by your professional restoration expert to revive your cabinets. It is surprising how much hardware can date a piece of furniture. If you want your old, outdated cabinets looking new, then the best place to start is with the hardware. Choosing the hardware first may seem like a weird choice since you will need to paint or finish the cabinets before hardware goes on, but the hinges and handles will give you a good idea for what type of look you are going for. The handles will help you determine if you are going for a more modern design in your kitchen or if you want things to look traditional or antique. If you can figure out what kind of handles you like, then you can eliminate a lot of options of directions you could go. One way to help you narrow down your options is to look at the hardware in the rest of the home. There is no rule that they have to match, but coordinating them throughout the house is something that can tie everything together. Another way to make your cabinets look new is to get them painted. This is especially helpful if you have cabinets that have a lot of areas that need patching with wood filler. Paint is a great way to cover up imperfections in the wood or it’s a great option if you have cabinets that aren’t made from solid wood and need reviving. If this is a style option that you want, you have endless options for colors that you could do. You could literally change everything about your kitchen starting with the cabinets. One style choice that many people are using right now with their painted cabinets is to have two-toned cabinets. They paint one color on the uppers and a different color on the lower cabinets or they keep them all the same and use a kitchen island for an accent color. This allows you to keep your kitchen timeless and conservative while bringing some pizzaz in a small area. One of the most popular options for reviving your cabinets is to get cabinet refinishing. You can have a professional come sand everything down and pick your shade of finish from there. Though there aren’t as many shades as paint, there are loads of options when it comes to what kind of shade of wood you can get. You can even mix stains to get your cabinets refinished to the perfect tone. Paint colors can be a little trendy and may not last as long as the timeless wood finished look your local professional can provide. ERX is the premier Las Vegas professionals that can help you turn your old space into a beautiful new space your whole family can enjoy.